We live in a townhouse with a good sized kitchen, but hardly ANY counter and cabinet space. Since I spend so much time in it, I am always looking for ways to save space and make the kitchen as efficient as possible. These 3 ideas have been the most helpful ones that I’ve come up with and hope that it will help some of you as well. The picture above is the door of our refrigerator. Purchased at Bed, Bath and Beyond these little canisters hold all of our spices (saving TONS of cabinet space) and have heavy duty magnets on the bottom that ensure they won’t go flying every time you open your refrigerator. They’re really made to go on a magnetic strip that hangs on a wall but since I have so many spices I started putting them on the fridge and the collection just kept expanding. I use a label maker to make small labels for each of them on the lip of the tops so they can be identified without ruining the sleek look. This next idea is the best thing that ever happened to our kitchen. A simple metal bar that I installed on the wall under the cabinets, which is now home to the utensils that I use all the time and were always crowding up our kitchen drawers. Getting them out of the drawers not only gives you more drawer space, it makes it super convenient when you need to use them. I bought the bar at IKEA and then bought this pack of hooks. 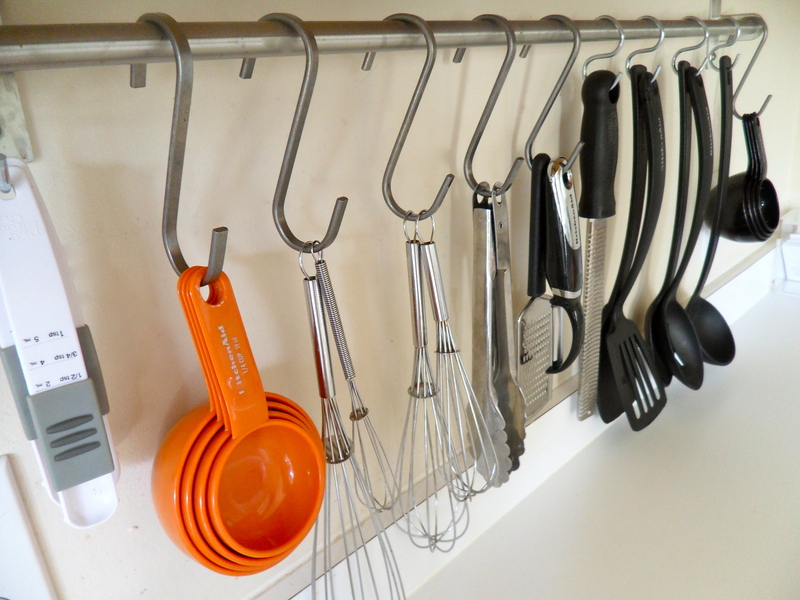 The hooks are long so when I went to hang measuring spoons, zesters, etc. they were hitting the counter so I went to Lowe’s and bought smaller S Hooks. They had to be bent with pliers to open them up enough to fit on the bar but they work perfectly for the longer utensils. The last idea comes from IKEA also. We got a set of beautiful knives as a wedding shower present from my best friend that we loved, but the block that they came with was taking up so much counter space that we didn’t have room to do anything. We got this simple magnetic knife rack. 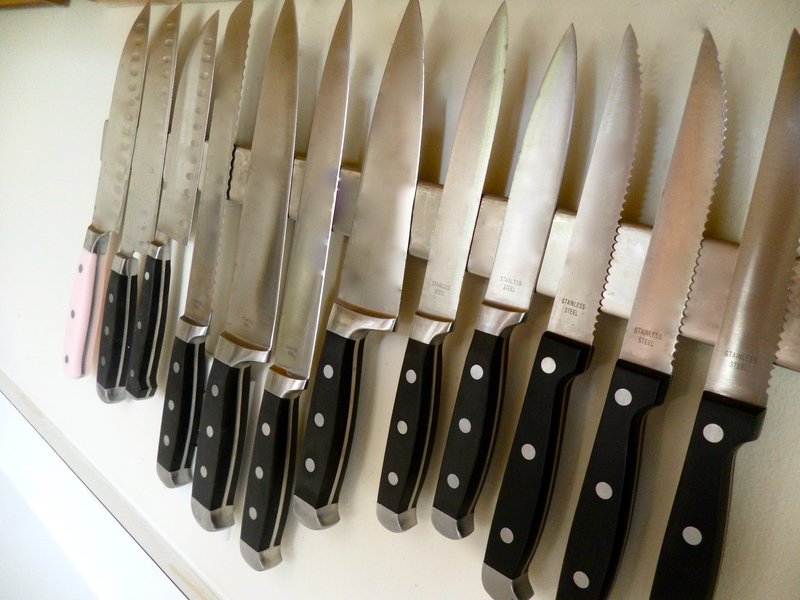 It hangs on the opposing wall of the utensil bar right next to our stove so it’s easy to find, use and store all our knives while saving lots of counter space. Any kitchen space saving tips you guys use? I’d love to hear about them!